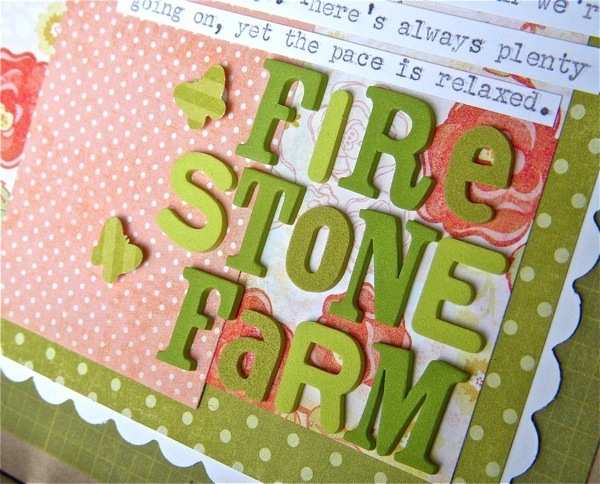 Have you ever chosen a color on your scrapbook page to create a feeling calm? or excitement? That was one of my recent Get It Scrapped! assignments. I selected the color green, typically associated with being refreshing, quiet, natural, calming. That’s why they have “green” rooms at TV studios for performers to wait in. 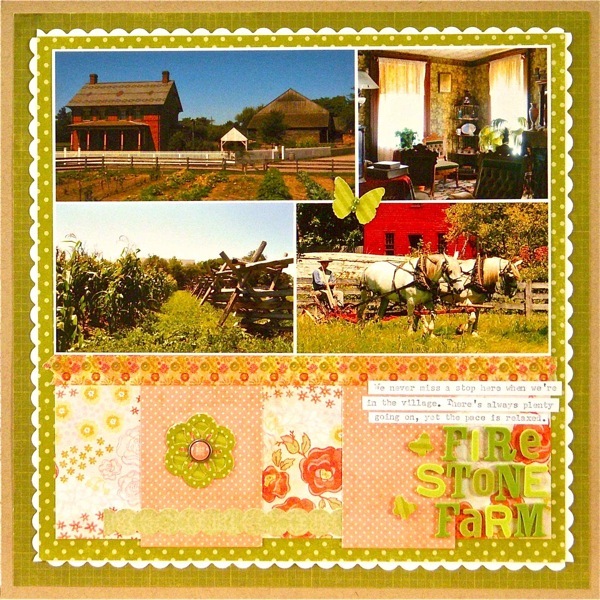 The layout is about Firestone Farm as it looked in the 1880's. We never miss a stop here on our visits to Greenfield Village. There's always plenty going on, yet the pace is relaxed and unhurried. I chose to work with olive tones to give the layout a nostalgic, old-fashioned feeling. The white scallop border and coral floral patterns provide contrast and variety. You can see more examples of different colors and the emotional responses they tend to trigger in the article here. Interesting topic to consider the next time you are choosing colors for your layout! love the layout sue! the feel of the paper certainly matches the feel from the photos! Such a pretty green color Sue. I like your choices of pattern paper for your photos. It makes for such a comforting feel! I never thought of green as calming, but I can see it. Looks like a fun place! hmmm, thoughtful idea. Love the layout and your photos are fantastic, as always! Really beautiful Sue!! The Green is gorgeous paired with the Pink!! Beautiful! Yes, I try to conjure up a mood on every page I make. Perfect colors for your photos and the mood you are setting. Really like the mixed type and shades of green title. So nice to have a favorite place you can visit again and again. Pretty color mixing here, Sue. I am only semi-conscious of the color of the paper when I scrap, but I guess it does tie into the mood or feeling it evokes when I am choosing the ones to use. I love color, so I really try and mix it up. That is definitely a relaxing color & layout - makes me want to stop there & relax a while. The pink and green really work well together!